The basic premise of organizing the KonMari Method way is answering one question – “Does this spark joy?”. This week I read the The Life Changing Magic of Tidying Up by Marie Kondo (she coined the term KonMari Method by combining syllables from her last and first names). UPDATE: This book has proven to be so popular that there is even a Netflix series based on it. You can read my thoughts on the Tidying Up with Marie Kondo Netflix series here. Let me emphasize that the KonMari method of organizing revolves around the concept of discarding items – not storing them. And when it comes to discarding something, you must physically hold the item in your hand and ask yourself “Does this spark joy?”. If the answer is yes – you keep it. If it is no – you get rid of it. This concept really hit home with me because I have always said – surround yourself with things that you love. or, we might need it someday. Kondo also says that when we do this exercise, we should come at it from the frame of mind of choosing what we wish to keep, not what we wish to discard. 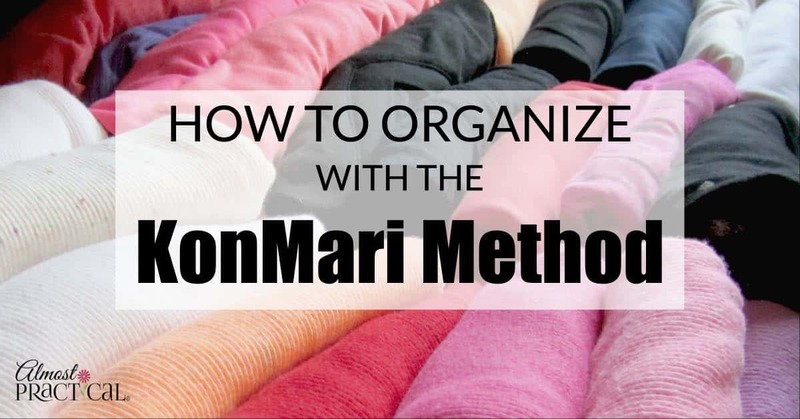 Organizing using the KonMari method, also involves tackling categories of items, like sweaters or shoes or papers – not spaces, like bedroom, hallway closet, etc. We usually have items of the same category stored throughout our house in different places. Using Marie Kondo's approach – we should collect all of the items that we own of a particular category from every corner of our house and spread them out on the floor or other surface. Then we should physically pick up each item and ask ourselves if it sparks joy. Once we have decided what to keep, we should then store everything of ours in one place – like our own closet or our own shelf. To get lasting results the whole process should be done in one fell swoop – which is about a 6 month time frame. During this period of intense organizing, you should be able to go through every one of your possessions and pare down. Is The KonMari Method Reasonable? Clearly, Marie Kondo has used the KonMari method of organizing with her own clients and achieved good results. As I read through the book, I was struck by a few thoughts. On more than one occasion – I almost felt that the author was a bit neurotic about the organizing process. She began having an interest in tidying at age 5 – and read magazines and books about the subject throughout her childhood. It really shows that she has a passion for what she does – which is really what it takes to be successful at anything. So kudos to that! However, at age five most children are doing kid things and enjoying their childhood. Marie's business is based out of Japan. I must say that I am somewhat ignorant about the customs, and the home and storage logistics of a different culture. Homes come in many shapes and sizes here in the US – and I imagine that is also the case for other countries as well. So, in my opinion, no matter where you are, what works in a large home does not necessarily make sense in small home. For example, Marie recommends that you store all like items together in one place. And this place is not necessarily the place that you use it. This makes a lot of sense. When you need something – there is only one place to look for it. But, if it is not stored in the place that you use it, then you may need to actually get up and walk across your home to get the thing that you need. In a small home, this is not such a big deal. In a large home – this could be challenging. Last night, as the snow swirled outside, I sat on my couch curled up reading – what else? – The Life Changing Magic of Tidying Up. And I became a bit chilly. So, I thankfully grabbed a blanket throw that was conveniently draped over the arm of the couch. We also have a couch in another room in the house – and there is a blanket in that room too. I think that if the blankets had been in one central location, somewhere else in the house – I probably would have sat on the couch and shivered while reading my book. Laziness, I know. But it sparked joy in me to have that blanket right where it was. After reading this book, I am definitely inspired to make an attempt at organizing the KonMari method way and start discarding things. The storage space in my home is finite. And I definitely become edgy and stressed when we accumulate too much. I am challenged in that we have six people that live here – all with their own stuff. Many people get the urge to clean up when under pressure … But this urge doesn't occur because they want to clean their room. It occurs because they need to put something else in order. When the personal crisis is over, the urge to tidy up goes away – which means that a visible mess keeps us from dealing with the true problems in our lives. If our home is always in a state of good order, then when other problems arise in our lives, we have the mental capacity and the space to deal with them. We don't avoid them by using our time and energy to clean up our house. I can relate to this. Related: Use the KonMari method to fit more into packing cubes when you travel. Have You Read The KonMari Book? The next book on the list is The 8th Habit: From Effectiveness to Greatness by Stephen R. Covey. In case you missed it, last week we read Time Management from the Inside Out by Julie Morgenstern. You can read the book club review here. Here is my after KonMari Method photo of my t-shirt drawer. I think I like it because I can see everything at once. Neena, I’m so glad you reviewed this book. I grabbed the Kindle version and read it through. I’m hoping to take my first steps this week. I think the most powerful part for me was “Visualize your destination.” It helped me get in touch with the essence of the life I’m after – both in my home and in my business. And I can see how using the KonMari Method can get me there. I’ve also explored the business posts on your blog and appreciate what you’re offering. I signed up for your updates and look forward to learning more from you. Thank you for sharing your expertise and passion with the world! How is the KonMari method coming along for you? I, too, was very inspired by this book. Though her methods can seem a little extreme, I am very aware of how much time I waste managing things (meaning objects that I own), many of which I do not use or need. Visualize your destination is powerful – it really makes you set a goal for the organizing process. Otherwise you just end up shifting stuff from one place to another. I also like her approach of organizing by category. After reading the book, I was inspired to tackle the over abundance of office supplies in my home. You have no idea how many notebooks, paperclips, tape dispensers, etc. I collected from the far corners of the house. But now everything is in one place and it really has given me a feeling of control over my home office. Thank you for the compliments about my website, I am so happy to have you join us! I just read this book a couple weeks ago and have begun the “fell swoop” of decluttering and organizing my entire house. I absolutely love the book! It’s a different, refreshing view on tidying. It’s simple and makes sense. In practice, I have gone through my clothes and am now decluttering all our books. I feel more free and strangely more confident than before I began the process! I enjoy your review, your takeaway from Kondo’s book. Thank you. Isn’t it amazing how much lighter of spirit we feel when we have less stuff? I have really taken Marie Kondo’s strategies to heart – including the “Does it bring me joy?” question. In fact, I have always said “surround yourself by things you love.” – but it was hard to put into practice. 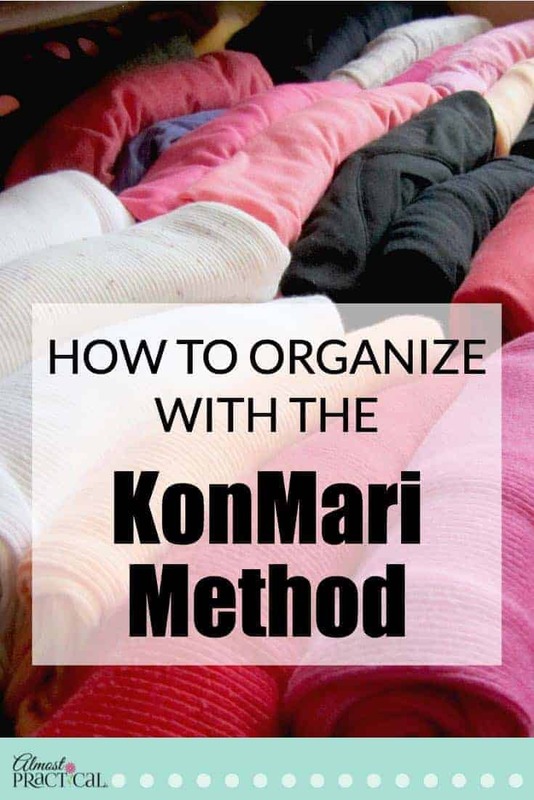 The KonMari method and this book – provide the process to make it happen. It sounds like you also have found the same inspiration from her words.